A little over a week ago, the San Francisco Examiner ran the Op-Ed: “Fast and cheap: Getting Caltrain to Transbay Terminal … this year.” Author Stanford Horn proposed extending Caltrain via Muni’s T/N tracks on King Street and building some more tracks on Howard Street to a platform at the new Transbay Terminal, as a stop-gap measure until the DTX tunnel is built. That goal could be achieved in 99 percent less time, at 99 percent less budget. In fact, the project is so simple that it shouldn’t take more than a few weeks or months to build, involving no new structures taller than a cantaloupe or excavations deeper than a watermelon. To point out another obvious problem: although the track gauge is the same, Caltrain’s rolling stock is wider than Muni’s. Since Muni uses high-level platforms, that means if you plopped a Caltrain onto Muni’s tracks, it would crash into the platform. Furthermore, Caltrain’s equipment would likely derail on Muni’s track switches. Horn’s piece was savaged in the comments section as totally unworkable. That said, at least Horn is thinking outside the proverbial box. It’s also a reminder that railroads didn’t always segregate streetcars and heavy rail passenger services. And in many countries, they still don’t. First, there’s nothing unprecedented about running heavy rail trains, such as Caltrain, in the street. The alignment that is now used by Muni’s Embarcadero Heritage Streetcar line was actually a freight train route that went through the Ft. Mason tunnel all the way to the Presidio. In fact, the San Francisco Belt Railroad ran trains as far as Fort Mason until 1993. (The Fort Mason tunnel, as Streetsblog readers will note, is part of a proposal to extend Muni rail service that’s currently being studied.) And, of course, mainline trains still run down the street on the other Embarcadero, in Oakland’s Jack London Square, where the rails are shared by Amtrak trains and freight. So it’s an intriguing idea to extend conventional rail service up to the very tip of San Francisco, considering the right-of-way is there and mostly already in use by trains. Furthermore, the current N/T route along King and the Embarcadero east of Market will be rendered largely redundant once the Central Subway extends the T line to Chinatown next year. Again, unlike with BART, the track gauge of Muni is the same as the national railway network standard, including Amtrak, Caltrain and other commuter railways, and freight services (4 ft 8.5 in. versus BART’s 5 ft. 6 in. tracks). That means some kind of integration with Caltrain is not totally impossible–just very difficult. In fact, regulatory hurdles are probably a bigger problem than the physical infrastructure challenges. For example, the platform issue could be solved with “gauntlet tracks” that steer the wider trains away from the platform. Or, even simpler, SFMTA could remove the high platforms. There may be other issues, such as the turning radius of the switches, flange depth, etc. But that can be addressed too, albeit over a much longer time frame than a few weeks or months. And while readers might be tempted to dismiss the idea of integrating Muni and Caltrain, keep in mind that in Europe, there’s the concept of a “tram-train.” These are streetcars that join the regular rail network, accelerate, and travel out of the city like a conventional train, sharing tracks with standard intercity equipment–that would be the inverse of Horn’s idea, and would mean a light-weight streetcar-like train would operate on the Embarcadero tracks, and then continue down the Caltrain corridor. Given Caltrain’s already strained capacity and the fact that it will eventually be sharing tracks with High-Speed Rail, this seems even harder to do. The larger point is that some ideas that are dismissed as ‘crazy’ in the U.S. are actually pretty commonplace overseas. In the U.S., there is a different regulatory framework for urban rail transit, such as Muni, which falls under the auspices of the California Public Utilities Commission (CPUC) and the Federal Transit Administration (FTA) versus the national railway network which is controlled by the Federal Railroad Administration. These regulatory differences have largely kept the two modes completely separate. There are places where they share tracks–a few portions of San Diego’s trolley system, for example, are used for local freight train deliveries–but they are separated by time (the freight deliveries have to be done late at night, when the trolleys aren’t running). But the regulatory wall between the two types of trains may not be insurmountable. In fact, an advanced signaling system could allow the modes to move together safely–and legally. Technologies such as positive train control, which can override commands of a human operator and stop a train if it is driven past a red signal, make it safe enough to run heavy mainline trains on the same tracks as streetcars. As we look at expanding services, planners should also look for opportunities to integrate rail services more seamlessly. From a passenger perspective, the benefits are obvious, since it’s a way to eliminate transfers, expand services, and make for shorter, more reliable commutes. Furthermore, once the downtown connection to the Transbay Transit Center is complete, there’s likely going to be insufficient capacity, and it would help Caltrain’s schedule, especially once electrification is completed, to have a few alternate destinations in San Francisco. The takeaway: Horn is greatly simplifying what would be involved in extending Caltrain on the street. That said, it’s certainly worth thinking about better integration of train modes in the Bay Area. Integration does not need to, and often should not, mean using the same tracks. The main reason that U.S. rail systems are not as integrated as they could be is not regulatory segregation of modes, it is a lack of financial prioritization. Thanks for this article, Streetsblog, and for thinking out of the box. Such solutions may provide the most bang for the buck. (On a related note) When it comes to bus transit, as much as I love bus bulbouts I’d welcome statewide legislation requiring motorists to yield to all public transit vehicles as they pull away from transit stops. This would help speed up transit on all routes and this would cost much less (financially) than bus bulbout construction. Santa Clara county tried to do this, even installing orange inverted triangle flashing lights on the rear of buses when merging. They eventually abandoned the program though: it wasn’t law. Making “yield to buses merging” law might help though cities like San Jose don’t have the police force required to crack down on minor violations. Good idea but needs solid enforcement to be effective. We can’t even get people to signal their turns. So, what I gather is that since the DTX is pretty much a washed up plan for the next decade or so, we will have to settle for Caltrain trains slowly meandering city streets and along the Embarcadero as Plan B. This city is a complete joke. Second, the city will NEVER approve huge double-decker train sets to chug along this route. The idea of extending light rail to the wharf along the Embarcadero has been proposed and rejected numerous times. Don’t expect a round of applause for Caltrain to use these tracks. Third, every single platform along the Embarcadero would have to be rebuilt to Caltrain specifications, as well as provide access for historic streetcars on the E line. So, it’s not as cheap and fast as you would imagine. Throw in turning radii. This complicates matters and adds time and cost, like you mentioned. We’re paying the price for poor transit planning and execution. There’s never been a serious buy in from the city or politicians to make the TTC a real transit hub. Otherwise, we’d be jumping on that electrified Caltrain train to San Jose in 2019. But, we’re not. We’re going to have to continue to live with what’s in place for the foreseeable future while traffic congestion worsens. Good luck, folks, getting around your Transit First City. Alternative: Run a light rail line to Transbay from Caltrain. The picture at the top is not from 1940. The Marmon-Herrington trolley bus, and the trolley bus overhead, put this at 1950-1952 or later. Before that date, the Ferry Building loop was streetcars only. The automobiles are also much newer than 1940. The point is to have a one-seat ride to/from Transbay and points south on the Caltrain line. Muni platforms wouldn’t have to be rebuilt at all. Gauntlet tracks would allow Caltrain to pass them without stopping en route to/from their own new platforms at Caltrain’s new downtown terminus near Transbay or the Ferry Building. Caltrain at just under 16 feet should fit under Muni’s wires alright (maybe with some lifting in places) … but their new Stadler EMUs would need to have dual voltage capability since they’re currently set to be 25KvAC only, while Muni runs 600vDC. Probably will never happen for myriad reasons, but the technical part *could* be made to work. Run HSR on Downtown SF streets. What could possibly go wrong? This is a terrible idea, and it’s completely baffling to me that Streetsblog are giving it any more oxygen than it already has. While it might be just about technically feasible, with a lot of expensive reconstruction of perfectly good existing infrastructure, it’s simply not good practice to mix heavy rail and light rail on the same tracks, as it cripples the capacity of both modes. There’s a reason all the examples given in this article of mixing heavy and light rail, and of running heavy rail down city streets, are from the past. Even the German tram train examples are historical relics that have been phased out in most of Europe; we used to do the same thing in the US. 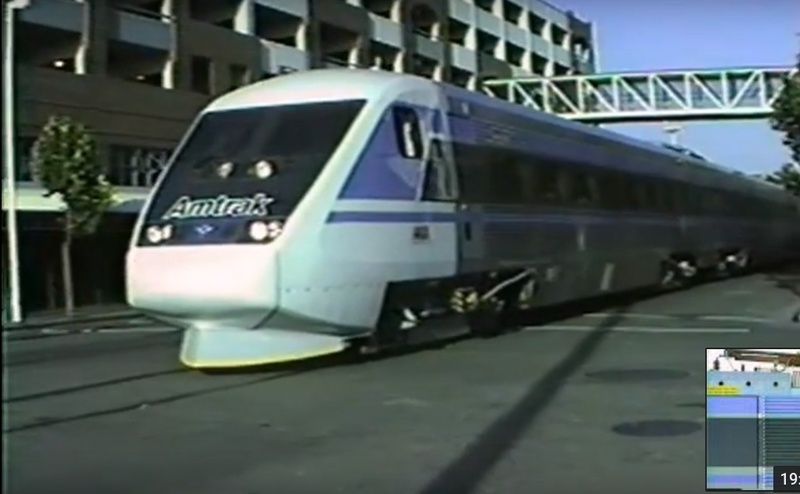 And running Amtrak down the Embarcadero in Oakland is another historical relic that is widely considered to be slow, inefficient, and dangerous, and for these reasons the CCJPA have been studying undergrounding this section of the line for some time. No, the problem of the lack of funding for the DTX should be solved by finding funding for the DTX, not by throwing out half-baked solutions that would cripple the capacity of both Caltrain and Muni Metro. We should be applying pressure on the MTC to make it a top funding priority, rather than their continued obsession with BART extensions to exurban areas and freeway widening. Interestingly, this sharing of tracks is happening in Waterloo, ON right now. The new light rail train system being built here will share tracks with a freight rail spur in the north end of the city. The system does indeed use gauntlet tracks to shift freight trains away from platforms, as well, the trains are separated in time from the LRT trains, and automatic derails are used to ensure runaway trains cannot end up on the LRT right of way during operating hours. Whoa, dude, the skyrises around Folsom, Brannan and 2nd and King sort of need continued service. The T will go into the subway, but there’s plenty of reason to run the N around the hook. For a lot less money you could have the N and T well timed to connect to Caltrain and completely pre-empt any traffic when those lines are running. Besides what Mark has stated, you’d also have to get a lot of rules changed by transportation authorities, not to mention the fact that with Muni and Caltrain sharing trackage they’d be forced to operate very slowly, especially Caltrain, considering each train consists of around 7 vehicles. Say IF Caltrain operated along Howard to the temporary transbay terminal…Considering Caltrain’s a train operating on city streets in downtown in this scenario, a railroad crossing at the Main/Howard intersection is likely to be constructed..Imagine how atrocious that’d be on traffic during rush hour/holidays? To me, suggesting Caltrain and Muni share trackage is doing too much with too little reward in the end…I love thinking up random, out of the box ideas but I at least wanna consider ideas that’ll have a good possibility of working. The idea is completely backwards. MUNI trains CAN run on Caltrains rails but Caltrains trains canNOT run on MUNI rails for the simple reason the massive weight of the Caltrain locomotives would destroy the MUNI rails meant for “light rail” trains. The rails for MUNI trains are physically “lighter” and not as robust as those of the Caltrain rails and that’s why a Caltrain locomotive would destroy the MUNI rails whereas MUNI trains can operate on the heavy Caltrains rails without incurring damage to them. And you can also extend the N down the Caltrain ROW to end at 16th/3rd in front of the new warriors arena, providing direct access to 2 lines during games/events. I don’t think the caption “A troop train near Aquatic Park in 1946. It got to this point on the street alignment now used by historic streetcar lines”. meant to imply that historic streetcars use the track by Aquatic Park, only that historically, trains did travel on the Embarcadero (the street alignment now used by historic streetcar lines). At least that’s how I read it. Try reading, not skimming, please. You’re right. That is the point and it’s called the DTX to the new multi-modal transit center. But, instead we got shafted on the promises made to us. No trains. Sorry. “This point on the street alignment” reads as “this point” referring to aquatic park. Thanks for the tips on how to read. Much appreciated. Now go away and troll somewhere else. The N is perfect timed to Caltrain arrivals. The N operator pulls into the terminal and lights up a smoke, waiting for the train. When Caltrain arrives, the N operator leaves immediately before anyone can board. Caltrain street-running in San Francisco? I can already see the headlines about idiot motorists getting hit. Nevertheless, the troop train would have had to traverse the street alignment used by historic street cars in order to get to Aquatic Park, which is, I think what the writer intended to convey; not that historic street cars used the track in Aquatic Park. It’s a fine point, and while the sentence was a bit ambiguous, I think your snarky comment (Fact check your work first, please) directed at the writer was uncalled for. If you are going to give it out, learn how to take it. And just because someone disagrees with you does not make them a troll. How will that work once Caltrain converts to EMU service? The Cadillacs are mid-1950s. The one closeswt to the train looks like a 1954 and the other is 52 or 53. Likewise at Millbrae. Caltrain arrives, people rush over to the BART platform and doors close in their face. Add another 20 minutes to the commute waiting for the next BART train. …… lights up a smoke, thereby doing his part to support the chemotherapy and mortuary industries. Have yet to see huge double-decker train sets “chugging” anywhere, trailing clouds of oil or coal smoke from their steam engines. Might as well rebuild the stations, raise the wires, and go for it. It’ll certainly be cheaper than the tunnel to DTX and allow service to reach it probably at least a decade sooner. The only hiccup might be the need to rebuild the tracks to support heavier trains. I’d imagine that Caltrain is likely using 136# rail. What is MUNI using? Trump wants to cut red tape, so maybe changing the rules wouldn’t be so hard. Don’t forget that Caltrain is expected to electrify, and its tractive power will almost certainly be 25,000 volts AC, which is nearly 40 times SF Muni’s tractive power of 660 volts DC. A Caltrain locomotive or EMU would overload Muni’s tractive power system–even if it could run on it. Caltrain rolling stock wouldn’t fit on the Muni’s system, and would indeed overload the tracks, too. But a Muni trolley wouldn’t overload Caltrain’s tracks or its (allegedly impending) electrification. It is indeed true that in Germany and other countries, there are trolleys that can and do run on trunk railways, thus they must be capable of running on 1,500 to 3,000 volts DC, or 15,000 volts AC at 16 2/3 hertz (Germany, Austria, Switzerland, Sweden, and Norway), or 25,000 volts at 50 (or 60 hertz in North America). It would be more practical instead to run trolleys on Caltrain’s tracks rather than the other way around, but the US is a ‘no-can-do’ country because of thoughtlessness and what-if-the-sky-falls regulations, which will surely preclude this sort of thing. As can be seen in the photo above, the trolley is indeed running on a 15kV AC trunk railway, so it is being done, therefore it can be done–just not in the US. Fancy the notion of a trolley running from–say, the outer (beach) terminal of the N-Judah trolley line–to Caltrain, where it would switch to Caltrain’s sooner-or-later-to-be-installed 25kV AC power and run to Gilroy–or, to add to the antithetical horror of Muni, Caltrain, and Santa Clara County Transit Authority planning & operations brass–the Muni trolley would then run onto the SCCTA trolley tracks–and switch back to 750 VDC–to Santa Teresa, Almaden, or Campbell. Eeek–I mean, ach! Mein Gott! That would mean single-ride interurban trolley service from San Francisco to San Jose and Gilroy without the two annoying and time-consuming transfers! (Muni-Caltrain-SCCTA.) This is something known as efficiency, which is unknown, if not anathema to US transit managers & planners, which makes any thoughts of doing it mental masturbation on this side of the Atlantic Ocean–but well known to the Germans, and pretty much everywhere else free of US transit planning influence. Just think: Someone in San Jose wants to come to San Francisco for the day and/or a night on the town; they could hop onto a trolley that could express to San Francisco (like Caltrain’s Baby Bullet trains) and ride right into downtown SF’s subway. Uh oh! Impure thoughts! Not necessary to be double deck EMU. By the time, Caltrain to purchase single deck EMU like BART car, and operate toward Muni tracks. No, actually mixing heavy and light rail is getting MORE common, not less. However, as noted by others, it generally consists of running light rail (Muni) on heavy rail (Caltrain) tracks, not the other way around. The tram trains are being done more and more, except in places with archaic regulations and crappy safety systems like the US. I really do like the idea of Muni trolleys running straight on to San Jose and becoming VTA trolleys. Why the heck not? Trolleys which can run on (electrified) Caltrain. Easy enough to order them. Seriously, why the heck not? It would make so many peoples lives easier. Please oh God why has nobody in power suggested this? I mean, we’re spending 1 billion a mile for a subway. Is the politics really too much to overcome???? Then lets do this! Why not? So many more people live on the Bart line, and they could just swoop down to San Jose or vice versa. We get to actually buy houses or condos near Bart knowing we have access all the way down south. My lord it makes too much sense. Congrats! This is almost as dumb as the original OpEd. I’m just going to assume that all the other commenters before mine have explained why. The train shown is a railfan excursion along the tracks of the State Belt Line, not a troop train. The date might be 1956. Railfan clubs used to regularly sponsor trips on railroads that did not operate passenger trains. Such a law is in California’s highway code–the appropriate signage needs to be on the back of the bus. If ‘Self-Driving Cars’ can be built and put on the road today, this is TRIVIAL in comparison. WHY ISN’T IT ALREADY DONE EVERYWHERE? …and done before S-D-C’s are on the roads ?? The absolute certainty with which commenters condemn or support an idea never ceases to amaze me. While it is true that U.S. transportation planning practices are shamefully outdated and tunnel-visioned, it is still physically and financially possible to increase integration of existing modes of urban and intercity transportation. Granted, in some communities, it may seem that a mafia-style “hit” is required to remove certain blind, deaf but very noisy opponents of new ideas. Suddenly running Caltrain trains on Muni tracks cannot be done TODAY, but such an idea can be planned and implemented if its virtues can be demonstrated to outweigh its vices. In particular, Europe offers uncountable examples multi-voltage train operation, and of high speed trains operating on infrastructure built for slower speed operation. Thus any arguments about either operation is totally wasted. More generally, thoughtful discussion and planning can and does often overcome opponents of any idea denounced as “not invented here” or “absurd” or “impossible”. Blind certainty regarding any idea — pro or con — wastes time while feeding the calcified minds of those frightened by new thoughts.